The runes read from the bottom upwards anti-clockwise and face outwards. 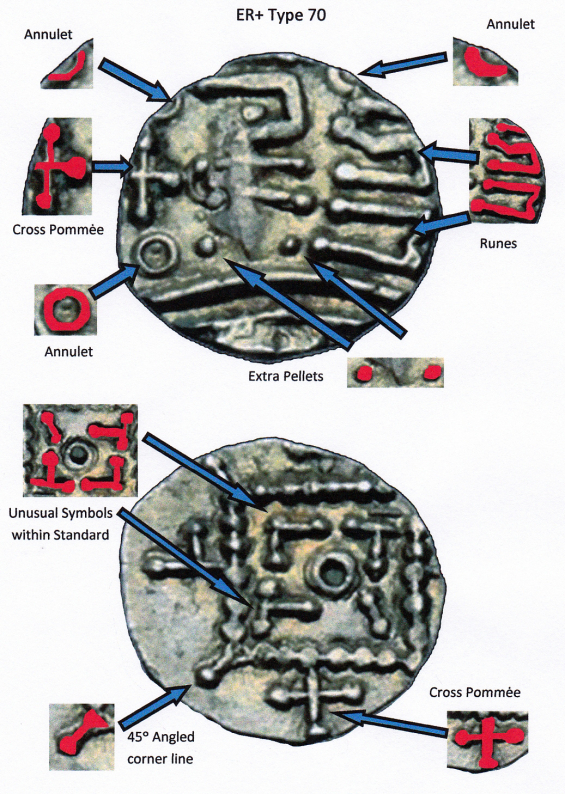 There is what could be a part rune or corrupted rune just under the top right annulet. The horizontal chevron > behind the rectangular shaped head is missing, there is a cross pommée there instead. There are two pellets each side of the bottom of the cheek bulge. It is because of the cross pommée behind the head, the two additional pellets and the extra possible rune that this specimen has been given a type of its own. The standard and its external symbols are typical but the inside symbols consist of two T’s, an L and a 45° line pointing towards the central annulet. All of the symbols within the standard end in a well defined pellet. Metcalf discusses the Q/R mule and questions whether the mint place of the R8, ER retro and the Q/R ER retro were the same place in west Norfolk. This coin is similar to the image shown by Metcalf. Abramson shows an image of an R8 ER retro he designates as S/1/11/120, he has interpreted this as EP ligate. 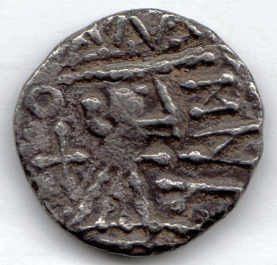 This single coin was found in Norfolk ID 66 and weighed 0.77g. 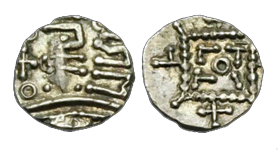 As mentioned above, this coin has a cross pommee behind the right facing head. This symbol is rarely found on the obverse of an R series coin. The EMC shows this on one R3, 2017.0074; in T&S this only appears on two R5's, Plate 24 405/6.and in the EMC "R series - Uncertain sub-class" coins 2001.1070, 2005.0243 and 2011.0069.